The Book Nerds love Amy Plum! We devoured her Die For Me trilogy and had the opportunity to meet her at the RT Convention a few years ago. She even inspired Jacque's trip to France! So when we discovered that she was writing a new series, we rushed to get ahold of the ARCs of the first book After the End. I dove into this book without reading the description, so I really had no idea what was happening or going to happen as I read. It is definitely a unique and interesting concept. It was fascinating to discover things with Juneau -- how what she was told made sense but how it wasn't really the truth. And what the truth is and how that also makes sense. Unfortunately, the book did not grab me as much as I think it could have, because I felt a lot of the plot was unrealistic and engineered simply because something had to happen as a reveal for the story. I'm not even talking about the Yara or any of the other magical elements. I feel that almost every action Miles took in this book was very unrealistic. However, he obviously had to find Juneau some way and then be on a road trip with her for several days, so I guess he should just randomly leave his house in L.A., drive to Seattle, and drive aimlessly around the streets looking for one person he's never seen before? Sure. And then let her convince him to drive her around after knowing her for about 5 seconds. Why not? Throughout their time together, Miles and Juneau are falling for each other, but I also had a hard time believing their love. "She's crazy -- like mental institute crazy! I love her." "He's lazy! But really good looking. So I love him." (I totally made those quotes up, but you get my point.) And, without being too spoilery -- but slightly so ignore this sentence if it'll make you nervous -- if someone you loved was shot, would you just carry on with your regular plans?! I wouldn't. I would immediately take that person to a hospital and/or try to get help. I didn't dislike the story. I read through the entire book in one day and kept reading even when I was so tired that I wanted to sleep, so I was clearly invested in the characters and intrigued by the story. I am curious about what will happen to Miles and Juneau in the next book, and I do want more of an opportunity to hear from Whit. As I said before, the idea is very unique and intriguing. And, it can also be noted that I did not love Die For Me when I first read it. It was only with reading the second book in the series that I truly fell in love. Maybe the same will be said for this one. Juneau is a seventeen year old girl from a small community in Alaska. For decades her village has lived without electricity, has traveled by dogsled, hunted for food...etc. They have not had any contact with the outside world since a nuclear bomb destroyed civilization in 1984 during WWIII. They are aware that there are other survivors out there because they occasionally hear aircraft fly overhead They have been taught to treat these individuals as a threat and to seek shelter immediately. One day while she is out hunting, all of the members of her village disappear. She heard the aircraft and knows they were taken against their will. She is left alone and scared, but she still has her powers. She can connect with various elements to gain information about her clan. The more she learns the more she realizes her elders have been feeding her lies her entire life...but why? There are real cities out there and now someone has imprisoned her friends and family. She makes it her mission to find them. Miles is the spoiled son of a wealthy pharmaceutical executive. He has been suspended from school and is trying to earn back his father's trust in the hopes of attending Yale this fall. When he discovers his father is looking for a teenage girl who would be an extremely valuable asset to his corporation, Miles decides this could be his ticket back into his father's good graces. All he has to do is find the girl and turn her over to his father. The book started out telling the story of Juneau's clan. I was a bit leery at that point because of all of the unusual names. Once she is on her own and sets out on her mission, I absolutely loved the story. The story is told with dual narrators, Miles and Juneau. Miles thinks she is completely crazy, but they both realize they need each other. As Miles comes to understand Juneau's upbringing and abilities, he realizes she has been telling the truth all along. They start to develop a friendship and feelings between the two are inevitable. Overall, this is a very entertaining story. I enjoyed the characters and was hooked from the beginning. The relationship was very believable and there was a lot of action to keep the pages turning. While I can't say that I understand Juneau's powers, they definitely helped propel the story along. Her abilities are a bit far fetched, but without them this story would have come to a halt a few chapter in. The ending was a bit of a shock and Amy left us with a HUGE cliffhanger. This is going to be a duology, but the name of the next book and a release date has yet to be announced. 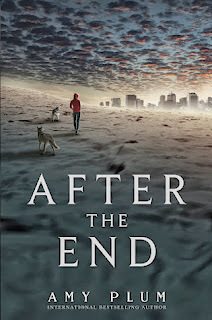 Since After The End is not going to be released until May 6, 2014....I am pretty sure I have a LONG wait ahead of me. If you were a fan of Amy's Revenants series, I would definitely check out After The End.